Attention Military Members! CAREER FAIR IN NORTH CAROLINA! 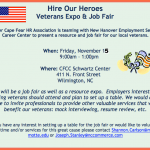 Hire Our Heroes Veterans Expo & Job Fair on Friday November 15th from 9:00AM – 1:00PM at the Cape Fear Community College Schwartz Center located at 411 N. Front Street in Wilmington, NC. Come network with employers, get some free advice from career experts and potentially a new job!